A Las Vegas dining tradition for over 30 years, THE Steak House at Circus Circus is acclaimed for serving the finest quality Midwestern beef, dry-aged to perfection in a glass-enclosed room viewable from the main dining room. 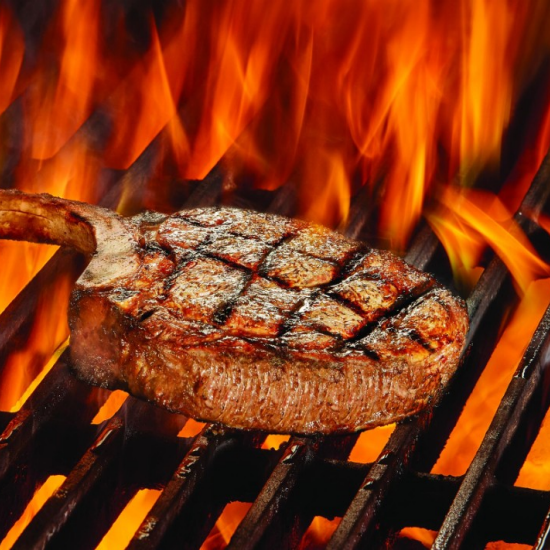 Prime cuts are prepared over an exhibition-style, open-hearth mesquite charcoal broiler. For over three decades we have been selected as the best steakhouse in Las Vegas. Our goal is to ensure the very best in quality and service for you, our valued guest. We offer exquisite dining in a warm atmosphere of casual elegance. The best quality Midwestern beef is aged to perfection for 21 days in our glass-enclosed aging room and then prepared to your order over an open-hearth mesquite charcoal broiler. Relax and enjoy your dining experience. As always, dinner includes fresh baked breads, Chef’s vegetable and your choice of black bean soup or house salad and garlic mashed potato, baked potato or wild rice blend.Tri-color peppercorn sauce and cheddar cheese sauce are available upon request. Shared entrée charge includes choice of Black Bean Soup or House Salad, choice of potato and fresh vegetable. Turn right from entrance towards the Avis Rent-A-Car desk. Follow walkway and curve left. Continue straight. THE Steak House will be on the right hand side. Curve around Main Casino then continue straight, passing Krispy Kreme. THE Steak House will be on your left hand side. Enter from the 3rd floor Promenade level then continue straight, passing Promenade level escalators. Turn right to take stairs/escalator down to casino level. Slight curve left, then continue straight. THE Steak House will be on the right hand side.